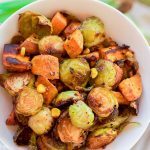 This healthy roasted sweet potato brussel sprout hash is a simple fall treat that drizzles on a light layer of olive oil, garlic, and cumin before roasting. 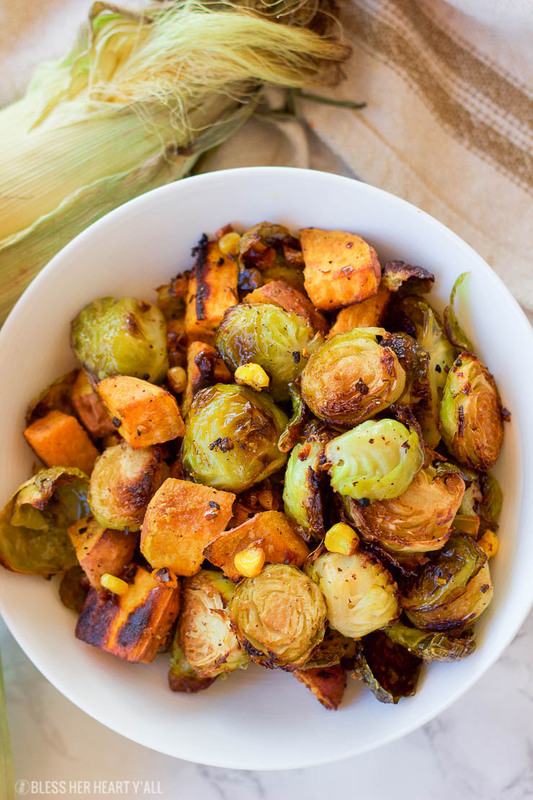 The vegan and gluten-free recipe produces perfectly golden baked sweet potato pieces surrounded by fresh spiced corn kernels and crisp and tender cooked brussel sprouts. I just couldn’t wait to share this recipe. Instead of waiting until next we like I had planned it’s coming out to y’all today! Some things are just too good not to share right away. That must be a new trend of mine. 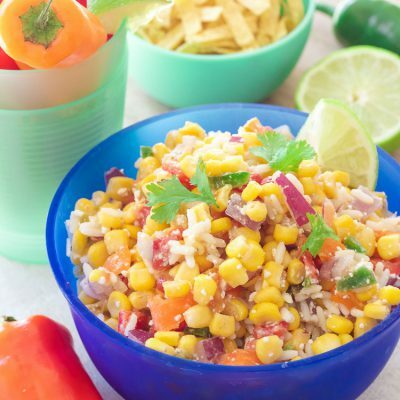 I couldn’t wait to share my Slow Cooker Mexican Quinoa Dip with y’all last week and now this! Don’t ask me to keep a secret because I clearly can’t keep anything to myself. I digress. 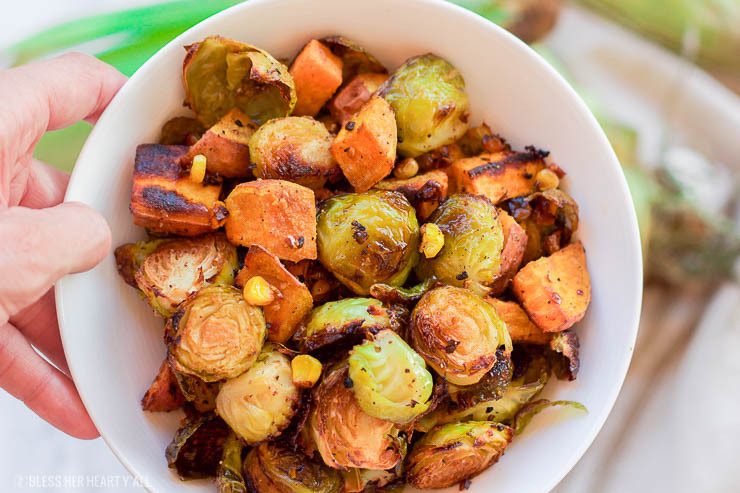 Anyways, this roasted sweet potato brussel sprout hash is that something. After making it this past weekend Alex and I decided to skip the traditional dinner and just have big bowls of this roasted hash while swinging in a hammock outside in the fall sunshine. Did we regret our decision? 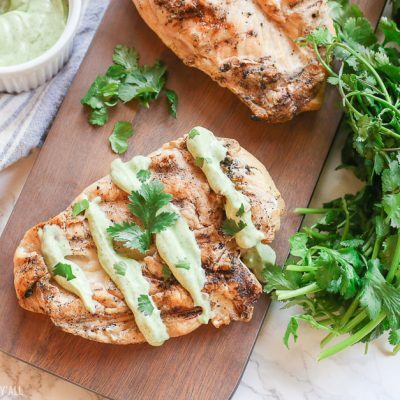 Obviously not since I am so excited to share this recipe with y’all today! It may have been the best decision we made all day. This isn’t your traditional sweet potato hash recipe. I like mine with roasted corn kernels and a splash of garlic, cumin, and red pepper flakes. I also don’t use balsamic vinegar for this recipe. Instead I use red wine vinegar. Yes balsamic vinegar is delicious on roasted sweet potatoes, but how about something a little bit different? The red wine vinegar adds a bit of a sweet tangy edge and plays real real nice with the spiciness in the recipe. And it’s really not “hot” spicy at all, more like “flavorful” spicy. Y’all catch my flow? Preheat your oven to 425*F and line a baking sheet with tin foil. Set aside. Combine and stir all ingredients together in a large mixing bowl. Spread the mix in an even single layer on your lined baking sheet and bake for 20 minutes. Remove from the oven and flip the veggies over and cook for another 20-25 minutes ro until the veggies are browning on the edges and a fork is easily inserted into the veggies. You can substitute out the red wine vinegar for another type of vinegar in your pantry but be aware that all vinegars give off a slightly different flavor with the veggies after the heat of the roasting gets to them. If you don’t have fresh end-of-season corn straight off the cob feel free to use a can of sweet corn kernels as a replacement. Don’t want it spicy? Take out the red pepper flakes. But as I mentioned above, it’s not spicy at all (Keep in mind that this is coming from someone who LOVES spice). 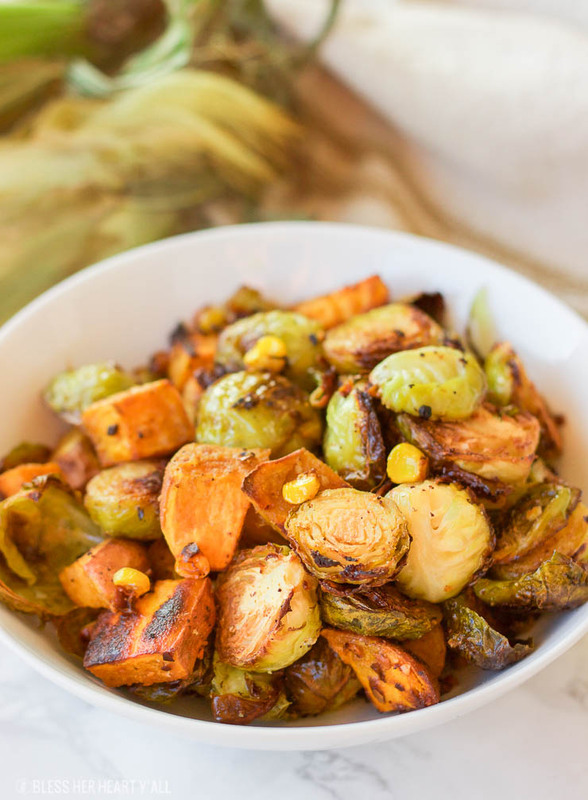 Ovens vary so much so watch your hash the last few minutes of roasting and take it out when you notice your veggies with the perfect amount of char to your liking. I like mine with crispy edges fo’ sure. I can not wait to share with y’all what is coming up the rest of this week! I’ve got one hell of a delicious week for y’all with a homemade Rigatoni D that is a copycat from Maggiano’s Little Italy. I’ve got some dunkable taco crisp appetizers coming out your way and also some tips on how to treat yourself in 5 minutes or less because we all could use a little pampering. Right? MMmm proper Autumnal comfort food, this! I can almost taste it through the photos! That’s some fall perfection! 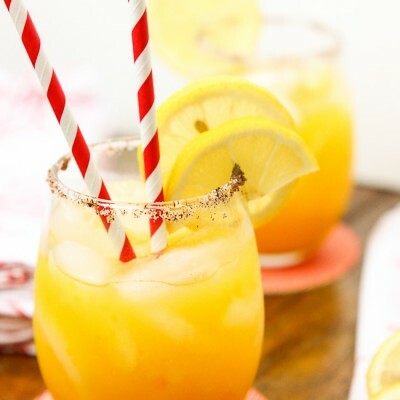 Love the corn in there too! What a perfect bowl of fall goodness. I am absolutely obsessed with the brussels sprouts available right now at our farmers markets – so good! 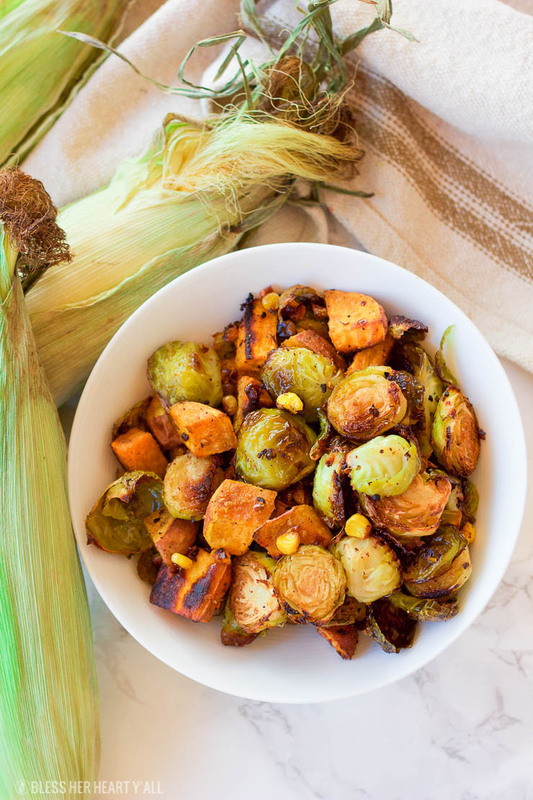 Oh it’s the perfect time to grab all the brussel sprouts you can! Ooh love this..and definitely going to try switching it up from balsamic to red wine vinegar!! What a fun combo! These are two of my favorite veggies! I’m a horrible secret keeper also; I try to exercise restraint, but I can’t hold water lol. I freakin love Brussel sprouts and sweet potatoes; I’ve never combined the two. I’ve never experienced “flavor spicy” I’m very intrigued, can’t wait to try this recipe!